What you need to know if you’re having a kitchen sink installed. Kitchen remodeling is a huge trend right now. New countertops, new cabinets – who wouldn’t want to upgrade their house to a home. When we customize our homes, they become an expression of who we are, and we put a lot of thought into the look and feel of the newly remodeled space. Many homeowners start their remodel with their kitchen. The kitchen is the place we spend the most time, especially quality time with our family, creating amazing meals – or even epic failures that are held against us for the rest of our lives. Remember that time you put too much garlic in the mashed potatoes? Oh wait, that was me. I too have gone through a kitchen remodel and having assisted thousands of clients with the plumbing involved with a kitchen upgrade I want to share a few things that 20+ years in the plumbing profession have taught me. You’ve invested all that money into new beautiful countertops and cabinets – don’t stop there, your plumbing is a long-term investment, and that kitchen sink and faucet are the most used items in your kitchen, except for mine – I think the coffee pot is the most used item in my kitchen. When you’re choosing your new kitchen sink, it is important to think about your lifestyle. Do you wish your sink could hold more dishes, so they don’t pile up on the counter? Do you use a lot of deep dishes? Do you cook with heavy dishes? 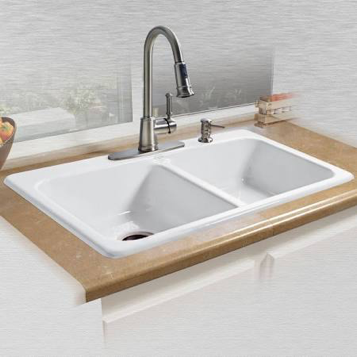 When choosing a new kitchen sink, you will see a variety of sizes, shapes, and finishes. Stainless steel sinks are lighter than cast iron and are often a great choice for people who use heavy cast iron pans because the stainless steel will not chip the way a porcelain sink will if hit with something heavy. Stainless steel sinks are easier to keep clean than their porcelain competitor and are more affordable to install because of their lightweight. If a color option is more your style, then a stainless steel sink isn’t going to be a great option for you. Cast iron sinks are heavy and solid. You can get cast iron sinks in pretty much every color of the rainbow. Cast iron sinks have a porcelain coating that provides incredible color, but you do need to be aware of using harsh chemicals on the porcelain finish as well as being cautious of tossing items into the sink as the porcelain could chip and leave you with an unsightly mark in your sink. I recommend to my clients that choose the cast iron route for their sinks, to put a rubber mat at the bottom to protect their investment. 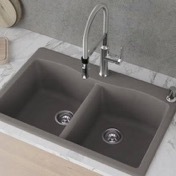 Want a color sink without the fear of chipping a porcelain finish? Then a granite composite sink just might be exactly what you’re looking for. 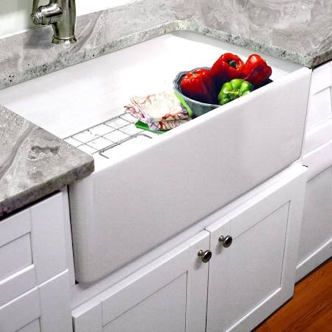 When people talk about composite kitchen sinks, they’re usually referring to a granite or quartz composite. These sinks are made with a combination of materials of resin filler and either crushed quartz or crushed granite. The mixture ratios vary by manufacturer but are usually about 80% crushed stone and about 20% resin filler. The combination of the resin and crushed stone makes a material that is very similar in appearance to real granite or real quartz without the high maintenance of real stone. 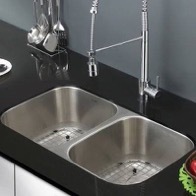 Both varieties of sinks are incredibly tough and resistant to stains and scratching; some manufacturers claim that granite composite sinks are the most durable sinks available. I know, this article is probably more information than you ever wanted to know about kitchen sinks, but I want to make sure you love your sink for many years to come. Your kitchen sink is going to be with you every day of your life while you live in your home and just like you want to choose the right mate for life, I want you to have the power to choose the right kitchen sink with no buyer’s remorse. Kitchen sink bays come in many depths and choosing the right depth will make a big difference under your sink. If you choose a sink that is too deep for your existing drain line in the wall your wall will have to be opened, and your drain line will have to be lowered, this can be a costly and messy project and can be avoided with a sink bay that is close to the depth that was previously installed. If you want that deep sink (like I did), your plumbing can be modified to accommodate the new depth. Kitchen sinks come in several bay counts. From the single bay, double bay and even triple bay options for residential use. Most homes in my experience have a double bay, one bay for washing dishes and the second bay for rinsing. The bay count is a personal preference and use. 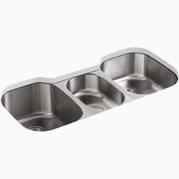 I have a three-bay sink, one for dirty dishes, one for rinsing dishes and one that my disposal is connected to for easy food preparation. Undermount kitchen sinks leave a smooth counter finish on top; these sinks are installed by the countertop company, not a plumbing company. The countertop company builds a support frame under your countertop to support the sink to hold it in place. While the sink is installed by the counter contractor all of the plumbing is connected to your favorite plumber, Robins Plumbing. Something to take into account when choosing this style kitchen sink is that undermount kitchen sinks are not easily replaced, and your countertop is custom cut to the specific measurements of your sink so if you decide down the road to change your kitchen sink, be prepared that you may have to have your countertop lifted and possibly replaced in order to accommodate a different sink. Overmount kitchen sinks are also known in the plumbing industry as drop-in sinks. These sinks literally drop in from the top, and a lip around the sink rests on the counter top holding it in place. 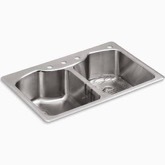 This is the most common style kitchen sink in residential homes. This style kitchen sink is installed by your plumber, and while you can buy different shapes of these sinks for a custom look in your kitchen, the rectangle is the most common and won’t require custom cuts to your countertop. Farmhouse kitchen sinks are really gaining popularity, and for a good reason, they are beautiful. Farmhouse style kitchen sinks, similar to under-mount kitchen sinks once your counter top is installed there is no going back to a standard kitchen sink without pulling your countertop and replacing it. If you really love that farmhouse style kitchen sink go for it, but if you think the look may lose interest for you over the next ten years, just like a bad tattoo, it will be painful and expensive to remove. For more details on farmhouse style kitchen sinks and the pros and cons check out our blog here.